Welcome back for the third day of Mayfairstivus, the nine day celebration of Mayfair Games’ DC Heroes Role-Playing Game! Today we’ll be looking at the 1989 character card for Doctor Fate! The first two editions of Mayfair’s DC Heroes Role-playing Game came with collections of character cards which included statistics. 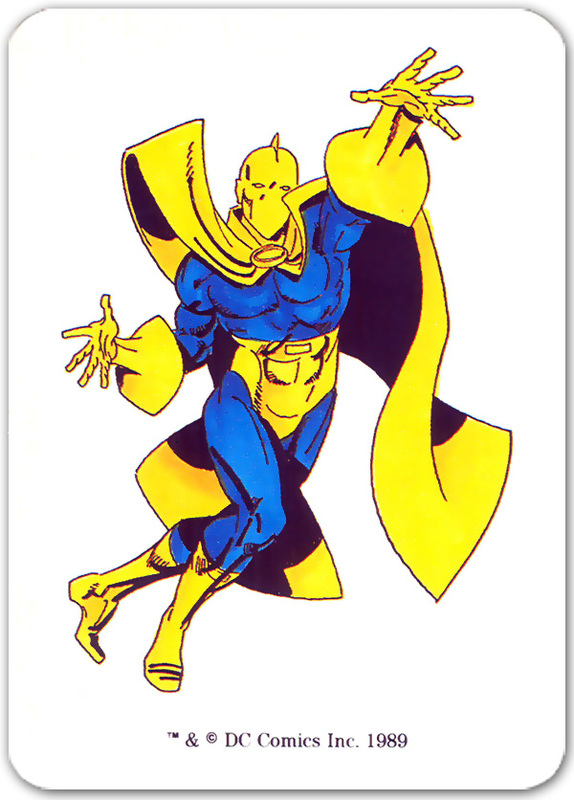 Doctor Fate wasn’t lucky enough to merit a character card in the first edition, but by the release of the second edition in 1989 he was headlining his own monthly comic. 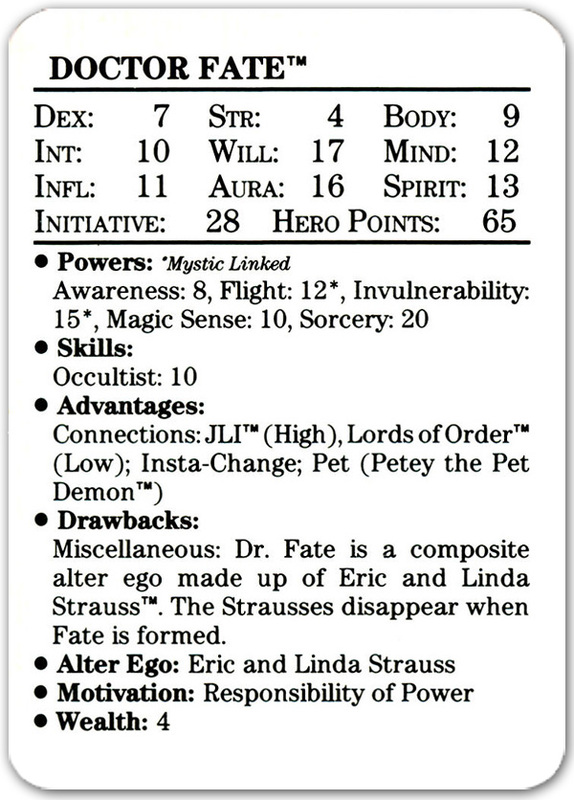 Below you’ll find the Doctor Fate character card (front and back) included in the 1989 edition of the DC Heroes RPG. The statistics above represent the second incarnation of Doctor Fate. At this point in time, the Ankh-Bolt Adventurer was a composite being created by Eric and Linda Strauss. It’s a complicated tale. When the story started, Eric was a young boy and Linda was his step-mother. By the end, they were dead. Their spirits were living on in other people’s bodies, they were married to one another, and they were raising a baby fated to usher in a new age for all mankind. … Yeah, I know how it sounds. Trust me, it was really good. During the time when Mayfair had the license to DC Heroes, they published a few different versions of Doctor Fate’s statistics. I considered posting them all here today, but decided just to focus in on the character card. These cards really were one of my favorite aspects of the box sets. I’ll be sure to include those other versions whenever I do a “Doctor Fate Week” here on ONCE UPON A GEEK. The art on the card isn’t the greatest, but I’ve certainly seen worse. It would have been nice if they’d had series artist Shawn McManus draw the card. He did a fantastic Doctor Fate! It’s worth noting that Doctor Fate’s “Sorcery” power is only rated at 20 points here. This is one of the weakest incarnations of Doctor Fate. The reason for this was that Eric and Linda were still learning the ropes as Doctor Fate, without the benefit of Nabu’s spirit within the helmet. Just in case you are wondering, Nabu was still around. He was inhabiting Kent Nelson’s animated corpse, and generally being a jerk to Eric and Linda. …. Yeah, I know. Trust me, it was really good. Don’t forget, the Mayfairstivus celebration continues at the following blogs! Be sure to check them out throughout the Mayfairstivus celebration (Dec. 1-9). Also, I’d like to send a quick shout-out to Tom Hartley. Tom inadvertently created the Mayfairstivus holiday by selling his second edition DC Heroes RPG box set to Frank Lee Delano (the mastermind behind the Mayfairstivus crossover event). Thanks Tom! We’re taking a break on Saturday and Sunday. Our Mayfairstivus coverage will resume on Monday! Come back then when we look at the Animal Man character card from the 1989 edition! That was also the first appearance of the “sorcery” power, which we called the Captain Everything power. That one always bothered me a little. It was an easy and playable way to simulate a powerful magical character’s ability to do pretty much anything, but there was no way any player character was every going to have it. It was far too expensive for any starting character to have without taking so many disadvantages as to be unplayable. And if you tried saving up reward points to buy it later, until you got there you really would be Jimmy Olsen among giants. You could at least conceive of someday being as powerful as Superman or Batman, but figures like Fate, the Specter, and even Zatanna were on a whole other unattainable level. Worst of all, the power was largely unnecessary. It’s convenient for Dr. Fate to be able to simulate any power in the book, but nine times out of ten in the comics (and ten times out of ten in any game I’ve ever seen), it’s only ever flight, shields, and energy blasts, with occasional gusts of telepathy and telekinesis. Much easier, and cheaper for starting characters, and more interesting, to take a few of those as Mystic Linked powers. That’s essentially what they did with the non-mystical world-beating figures, like Dr. Manhattan: gave them ridiculous numbers of powers at ridiculous power levels, rather than a single catch-all power. Don’t know why they got lazy with the mystical characters. @Shig – Good analysis of the Sorcery power in the game. That power set has always been troublesome for superhero role-playing games. In fact, it’s been bothersome in the comics too. How often should have Doctor Fate or Doctor Strange just saved the day with an easy spell instead of three issues of fighting. It’s worth noting the Mutants & Masterminds game handles mystical abilities pretty well for player characters. Again, great analysis. I really appreciate the feedback. I was about to ask you how many character cards were in the first set, and then I realized you just posted all that information yesterday. Doi! I’d have figured with Super Powers Fate would have gotten one, but I guess a thirty card limit forces some serious cuts. Now I wonder why Martian Manhunter made the cut, since he’d only just barely returned to the JLofA. At least Dr. Fate had seen a solo back-up strip that decade. Did Kent Nelson get stats? That sorcery power reminds me of the “Multi-tool” in the game. Batman has that, right? It represents all the gadgets in his utility belt and how he always seems to have the perfect bat-device for whatever. Petey the Pet Demon? Whaaa….? That’s a new one on me! Sounds like it used a similar character gen and combat rules to the Champions game system from the early-mid ’90’s. I think you mean omni-gadget but you have the concept correct. It was prefurable to listing pages of Bat-this and Bat-that and, at least, had the advantage of being classified A,B,C,D omini-gadgets which limited the type of gadget could be used. I used to like to buy it for power armor guys and use it represent how they were always upgrading and altering the armors abilities all the time. Never used sorcery (that I recall) but I did use omni-power (I think that was what it was called) which is a non-magic version of that.